The US administration has decided to sanction the state oil company of Venezuela and has frozen its $7 billion assets. The US administration has decided to impose sanctions on the state oil company PDVSA [Petroleos de Venezuela]. Accordingly, the company and all its related assets were included in the sanctions list. White House National Security Advisor John Bolton and US Treasury Secretary Steven Mnuchin announced the sanction decision. 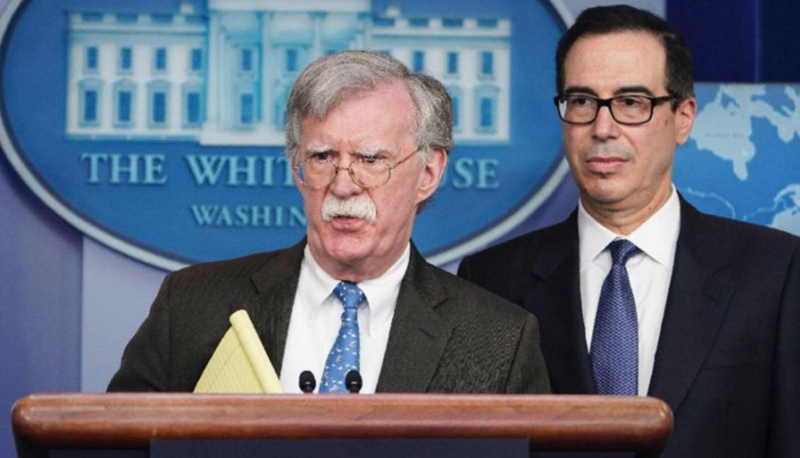 "We have continued to expose the corruption of Maduro and his cronies and today's action ensures they can no longer loot the assets of the Venezuelan people," U.S. national security adviser John Bolton said at a White House briefing. Bolton said Monday's announcement would block Maduro from accessing PDVSA assets worth $7 billion and cost him $11 billion in lost export proceeds over the next year. Bolton added that Maduro had no legitimacy and that they recognized the opposition leader Juan Guaido as "the interim president of the provisional state". Bolton argued that many of the commanders in the army should now be in favor of Guaido and support Guaido. Answering a question whether they are considering the military options for Venezuela, Bolton said: "The president has made it very clear on this matter that all options are on the table". Mnuchin also stated that they do not recognize the administrative legitimacy of Maduro, and in this context, they have listed PDVSA on the sanctions list. Mncuhin also announced that they have frozen Venezuela's 7 billion dollars financial asset in the United States and said it would take under the control of the Opposition Leader Guaido.